My name is Erin, and I live in Dallas, Texas. I enjoy all sorts of “hands on” projects like painting, gardening, cooking, knitting, sewing and taking care of the house. 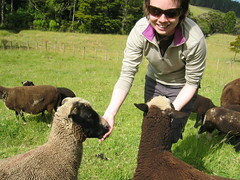 That’s me on the right feeding some sheep on a farm in Matakana, New Zealand. Yeah I like to travel too! I keep this blog to document project ideas and advice and to write. I’m actively seeking freelance writing and multimedia assignments. Love the header of the site. Very fun! I love the “green” themes! Keep up the good work. How nice to be able to write about a tax topic without the IRS circular in italics at the bottom. Your home improvement tales are very inspiring, although my garden presently consists of some flowerboxes on my balcony rail. I was going to get a housesitter for my week away, but then I read that NYT article you posted! Maybe not! Randy Lemmon, http://ktrh.com/pages/gardenline.html, said in his 3/22/08 broadcast on KPRC Radio that discarded vehicle tires leach noxious chemicals and should not be used in flower and vegetable gardens. I was searching for improvements on my own plans for my raised beds. I have a small backyard in Omaha NE. Your blog is perfect. I am going to help establish a small garden on a church site here in Omaha, and I wanted to encourage them to try a raised bed. You are a life saver. I love your write-up and the photo is great! I will revisit your site when I have another spare moment. The company that I work for distributes raintanks here in the Houston area. The cool thing is that they can be configured to fit any landscape area. For more information you can visit http://www.constructionecoservices.com. It is a great company that is a leader in the Green Industry. Wow. Your name is Erin Covert. My name is Erin Covert. We’re both from Dallas. Hello Erin, I think it’s great that more women are doing home improment projects. That is why I’m starting DIY electrical seminars for women in my area, teaching basic electricity and safety. Great greenhouse! I think your dad made one once by bending plastic pipe and covering it with plastic. I really enjoy reading about your activities … thanks! We’ve just started our 2nd successful year of Tuesday night programming here at the Dallas Central Library, downtown Dallas. We’d love to have you come join us! You’re doing a great job in print, on-air and on-line! Check your calendar and let us know. I manage a hands-on website for New Zealand specialising in resourceful living, grinding wheat for home made bread and raised vegetable gardening to that support low-income peoples so that they can better feed themselves, thus enhancing their lives and decreasing the burden on the welfare system. My mission is to decrease hunger and promote good nutrition, to foster self-reliant/self-sustaining behavior and to improve communities by improving their environment. For the http://www.wardwelfare.org website I want to integrate a wordpress theme like this one to enable people to leave comments. What theme is this? Does it have a name? I saved your articled “Engineering A Bumper Crop” from the 8/25/08 Dallas Morning News. Great job! I enjoyed your writing style as well as the information. I looked up Mr. Rupprecht’s phone number, but the one listed was not correct. Is there any way I might get in contact with him? Do you think he would let me come see his irrigation system? I wanted to do something similar in our garden this year. Thanks a bunch! I also have Skandia and TCS has ordered me several items in the past month and I rec’d them within a week. So they are available. I enjoy your perspective and writing style. Thanks. where can I get wooly thyme in the philadelphia area? I’ve been looking everywhere but no luck.